The Nina glass locket necklace is a classic heart shape. This photo locket necklace is outlined in Sterling Silver and can hold up to two of your favorite photos. 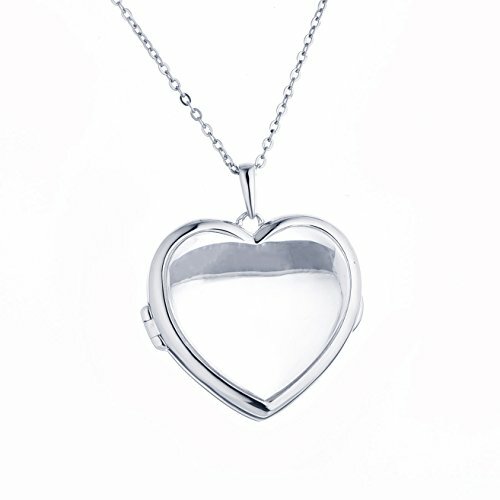 Each time you glance at your favorite photo through this glass locket, you'll know love is close. Nina is our neighbor. She's bright, hilarious and full of love, which is how we picked this beautiful heart glass locket as her namesake. The name Nina means "grace" in Hebrew and we've seen such grace out of this young girl. She stands up for what she believes and looks out for her younger siblings (and our girl) every chance she gets. Showcase the love of your life in this heart glass locket so they can share in your stories and you can keep love close. Includes Glass and Sterling Silver locket pendant and sterling silver cable chain. Available in chain lengths from 18" to 36". Our 18" through 34" necklace chains come standard with a 2" jump ring which may be used to shorten the chain by 2" and allows two length options.